The Hotel Anna Helsinki is a welcoming and homey hotel in Helsinki’s art and design district. This convenient location places the hotel within close proximity of many different sights, shopping areas, theaters, and museums. Fredrikinkatu, a street well-known for its multitude of boutiques, is just short distance away, as are the Stockmann and Sokos department stores. 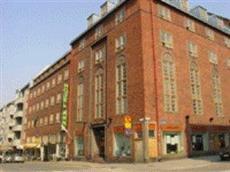 Transportation hubs are conveniently located a short distance from the Hotel Anna Helsinki. Each of the Hotel Anna Helsinki’s well-equipped guestrooms comes with a television, non-alcoholic mini-bar, telephones, umbrellas, and hairdryers. A tasty buffet breakfast (which is included in the room rate) is served for guests each day between 07:00 and 10:00 during the week, and 08:00 – 11:00 on the weekend. After an exhausting day of working or exploring the surrounding area, guests can relax in the sauna, which can also be booked for private use at an additional cost. Business travelers wishing to hold a meeting can make use of the Hotel Anna Helsinki’s conference room, which is equipped with an overhead projector, clipboard, TV, and video. This entire property is non-smoking.